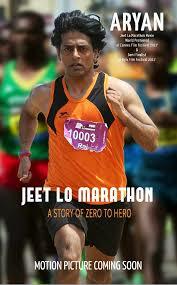 Review- Jeet Lo Marathon is a motivation story about Raj, who finds himself, his calling and changes himself. Its a story about recognizing and winning your call. Book Title and Cover- The Title is interesting and appropriate with the book. It gives us insight about the content. The Cover is attractive and goed with the story and title. Language and Narration- The Language of the book is simple and easy to comprehend. Narration is done well. Editing is done quiet well and the book is without any grammatical mistakes. Characters- All the characters play their role perfectly as per the story. Though with extra description it could have been better but it does not affect the reading. I liked the way Mr. Aryan portrayed characters and depth every character had. Storytelling skills of Mr. Aryan is amazing and the picturesque and detailed description helps readers imagine scenes in our head. However, Book was confusing in the start due to dull incidents but as you read further, it gets better and better and rest of the book is just fine and you can complete this book in one go despite the length of the book. All in all, Jeet Lo Marathon is unique, good and inspiring book which motivated you and delivers an interesting story.